Since I published an item covering Code First development with Entity Framework and WebMatrix, I have had a few requests to provide a guide to working with the Entity Framework from a database first point of view. This post answers those requests and provides a step by step guide to getting up and running with a WebMatrix web site based on the Northwind sample database that comes with SQL Server CE 4.0. Entity Framework (EF) is a technology that attempts to alleviate the friction caused when developers have to move between the conceptual representation of their application (the entities that represent the application's domain) and the logical or relational representation of the data (typically the database itself). On the one hand, a developer will work with their entities, such as Products or Employees using C# to instantiate them, bind them to grids, change them and so on. On the other hand, the developer will use another language (SQL) to persist entities to a data store (the database), or to retrieve them from persistent storage. EF's role is to map entities to database schema (tables, views etc) and to allow the developer to stick to C# alone - letting EF take care of transitioning C# Linq expressions to SQL to be executed against the database. EF does more than that. It is also a code and database generation tool. In the previous article, EF generated a database, including all tables, relationships etc, based purely on the defintion of some C# classes. In this article, EF will generate class definitions and mappings based purely on the schema of an existing database. It is possible to generate the various files that EF needs by using a command line tool - edmgen.exe. However, this article looks at the wizard and design tools that are freely available for this task instead. 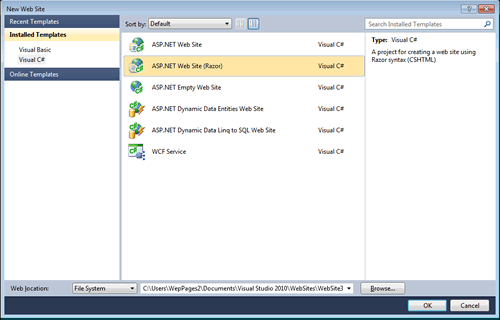 The EF wizard comes as a standard part of both Visual Studio 2010 and Visual Web Developer Express 2010 (VWD). It is not available in WebMatrix 1.0 and there are no indications at the moment that it will be added to WebMatrix in version 2.0 - the Beta of which is available now. So, that leaves VWD as the remaining free option. 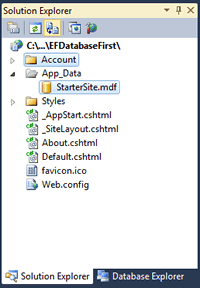 If you already have VWD installed, you must make sure that you also have Service Pack 1 as this contains the tooling for generating Razor Web Pages sites. If you download VWD, you automatically get SP1 anyway. Now you need a database. 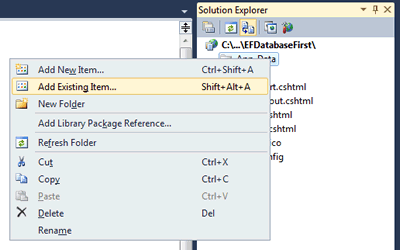 Right click on the App_Data folder in Solution Explorer and choose Add Existing Item. Navigate to the location of Northwind.sdf. 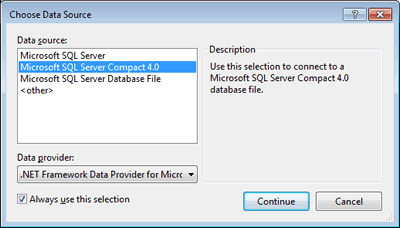 This is typically C:\Program Files (x86)\Microsoft SQL Server Compact Edition\v4.0\Samples. (x86) will only feature in the file path on 64 bit operating systems, so if you are working with 32 bits, leave that part out. If you cannot find a copy of Northwind.sdf on your system, download this sample from one of my previous articles and borrow the copy from the App_Data folder there. Once you have organised a copy of the database, you are ready to start the EF wizard. Right click in the Solution Explorer and choose Add New Item. 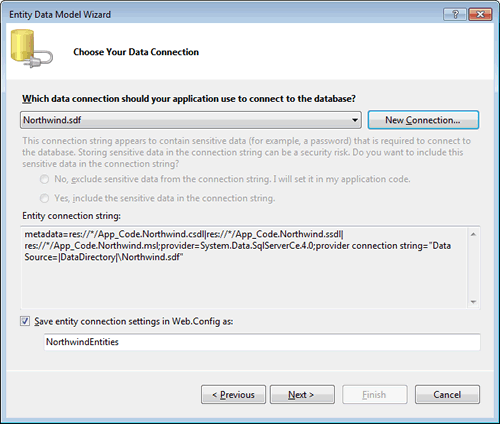 From the options available, select ADO.NET Entity Data Model and name it Northwind.edmx. 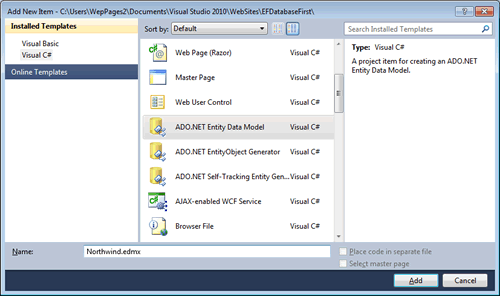 You will receive a warning that special files such as those that comprise and ADO.NET Entity Data Model should go in an App_Code folder. Click Yes. Select that so that the connection string is generated and leave the name of the connection string as NorthwindEntities. Click Next so that you are taken to the dialog shown below where you specify the objects to be used in the Model. 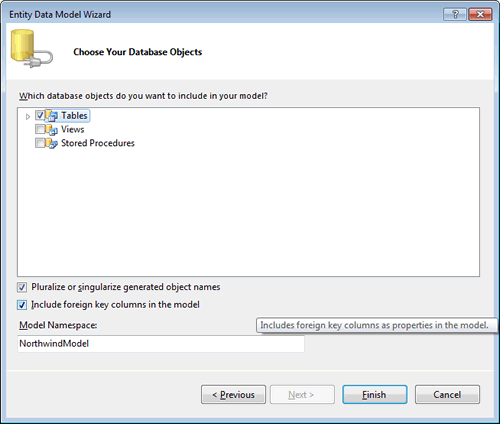 Choose Tables and leave the Model Namespace as NorthwindModel. Then click Finish. 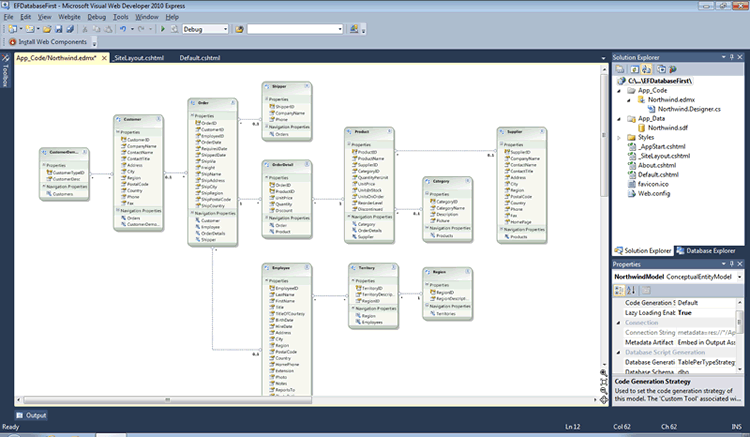 This results in an EDMX file, which in design view, shows the various entities in the model and how they relate to each other, much like a database diagram in SQL Server Management Studio. The EDMX file is an XML file that defines the storage model - that is the database itself, the conceptual model - that is the entities as classes, and how the two map to each other. The final part of the XML document is an XML representation of the design view that you see in the preceding image. Launch the page in a browser. The result should look similar to the following image. Microsoft introduced the Database helper with WebMatrix to make data access easy for beginners or people who know a little SQL, and that's fine. However, the Web Pages framework is built on top of ASP.NET and has the whole of the .NET framework behind it, so the Entity Framework, and indeed LINQ to SQL is available to Web Pages developers who want to use these technologies. 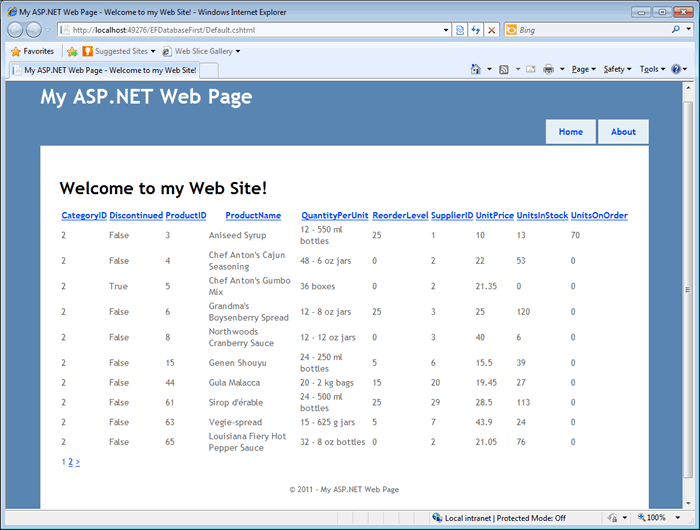 WebMatrix doesn't include the tooling to make this happen, but Visual Web Developer Express 2010 SP1 does, and it also includes tooling for working with SQL Server Compact databases - and it's free.